Focaccia is a popular Italian flat bread. 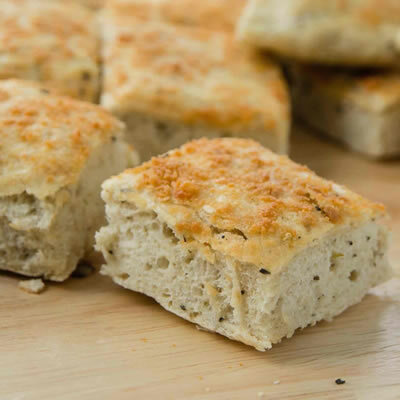 Focaccia is a yeasted Italian flat bread topped with any variety of topping the baker desires. This versatile bread, typically made in a wood fired oven, started in Italy and grew in popularity throughout the country. Focaccia can now be found around the world in artisan bakeries, but most places use a variation of this bread for sandwiches. Focaccia is typically compared to pizza, though focaccia focuses more on the bread and less on the toppings when compared to pizza. In addition, focaccia is generally much thicker than pizza dough. When making a focaccia, bakers use either sourdough starters, or more commonly, bakers yeast. After the dough is mixed and proofed, it is pushed into a large rectangular pan. Focaccia is made to be fairly flat, like a thick pizza dough. The dough is then dimpled by pressing an object or fingers lightly into the dough surface. After the indentations are made, the dough is brushed lightly with olive oil and sprinkled with herbs, garlic, salt, tomatoes or anything else a baker deems necessary. In Italy, toppings include tomatoes, potatoes, eggplant, honey, and much more. Focaccia is usually sliced in half, then used to make panini, a popular type of Italian sandwich.